This window was installed in 1971 and replaced a series of windows having a much more traditional design. o The central figure is Jesus because, in Christian art, only Jesus is ever shown with a halo quartered by a cross. o The figures drawn in the foreground wear the clothes worn by churchgoers in 1971, when the window was installed. The image represents the Church of today as it congregates at the feet of its Lord. o The skyline behind Jesus shows the landmarks of Oldham: in the central panel, on the left is the old Roxy cinema and in the right is a mill with its tall chimneys jostling for our attention. The left-hand window shows (left-to-right), the Civic Centre, Oldham Parish Church, and St Mark’s, Glodwick. The right-hand panel shows Mumps roundabout before it was removed by developers in 2012.
o Jesus is wearing Advent vestments. In Advent, the Church looks backward to the time when Jesus entered the world as a baby. It also looks forward to Jesus returning as both ruler and judge. So the message of the Great End Window is that Jesus will come again; his rule will extend as far as Oldham; and he may come back today. The window was installed in August 2015, to commemorate Peter Billingsley, who was a longstanding worshipper at our Church. The window is dedicated to St Hilda. 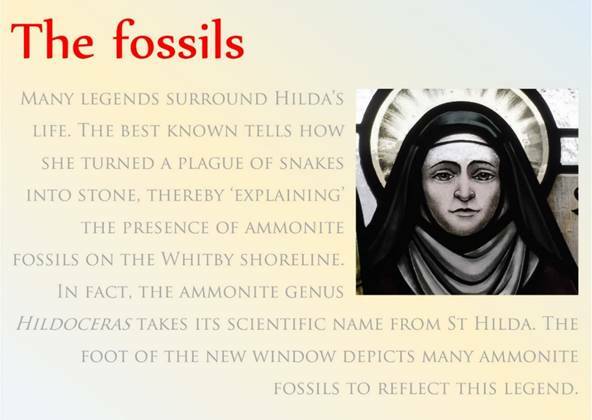 Hilda (or ‘Hild’) is famous for founding the large monastery at Whitby. She was abbess at several monasteries and an important figure in the conver­sion of Anglo-Saxon England to Christianity. The Venerable Bede, who was the pre-eminent historian of his age, says Hilda was born in 614, into one of the royal households of northern Britain. She built her first convent on the north bank of the River Wear, which was where she learned the traditions of Celtic monasticism. Bede describes Hilda as a woman of great energy, and skilled as an administrator and teacher. She gained such a reputation for wisdom that kings and princes sought her advice. The most famous story concerning Hilda was the so-called Synod of Whitby in 664 AD. The King chose Hilda’s monastery as the venue for the first Synod in British history. He invited churchmen from all over Britain to discuss questions of Church practice. The synod decided to adopt the method of calculating Easter currently used in Rome, establishing Roman practice as the norm in northern Britain. This window was installed in 1926 in memory of William Dodsworth and his wife Janey. Mary may be the same woman who anointed Jesus’ feet with costly perfume (Luke 7:36–48). This extravagant example of love, tog­ether with the ambiguous statement that Jesus had previously cast out seven demons from her (Luke 8:2), fed the tradition that this person had been a prostitute before meeting Jesus. The incident of washing Jesus’ feet belongs to the Galilean phase of Jesus’ ministry. Soon after­wards, St Luke lists the women who ministered to Christ which includes ‘Mary who is called Mag­da­len, out of whom seven devils were caste out’ (Luke 8:2). But Luke does not tell us that she is to be identified with the ‘sinner’ of the previous chapter. Only St John identifies Mary of Bethany with the woman who anointed Jesus’ feet (John 12; cf. Matthew 26 and Mark 14). This window was installed in 1932 in memory of Sarah Mallalue who died the previous year. The child here is John the Baptist because he is shown dressed in rough camel-hair clothing with a leather belt, which was the clothing John adopted when he was a man (Matt 3:4). We know nothing else about John the Baptist until he the Bible reintroduces him as a mature adult in Matthew 3:4, Mark 1:6, Luke 3:2, and John 1:15. We know even less concerning his mother Elizabeth. Elizabeth is depicted here as an old lady because Luke 1:18 says she was well-past child-bearing age when John was born, meaning his birth was miraculous. The Bible never mentions Elizabeth again. This lack of information allowed a vast number of legends to arise after the Bible was written. For example, a very ancient story says her grandfather was a priest named Matthan. (Being a priest means he came from the tribe of Levi.) This Matthan had three daughters, Mary, Zoia, and Anna. Mary got married in Bethlehem and had a single daughter, Salome; Zoia also married in Bethlehem and had Elizabeth, who also married a Priest and became the mother of John the Baptist (Luke 1:5 and 1:60). The legends say the third daughter, Anna, married an elderly man named Joachim, in Nazareth, and they had a single child, Mary the mother of Jesus. The window was installed in 1938 in memory of Annie Day, who died the previous year. St Martha is also known as Mary of Bethany. She appears in the Gospels of Luke and John. She lived in the village of Bethany near Jerusalem with her brother Lazarus and sister Mary. She is the middle child of her family with Lazarus being the eldest and her sister Mary the youngest. Jesus and his disciples were on their way, he came to a village where a woman named Martha opened her home to him. She had a sister called Mary, who sat at the Lord's feet listening to what he said. ‘Martha, Martha,’ answered the Lord, ‘you are worried and upset about many things, but only one thing is needed. Mary has chosen what is better, and it will not be taken away from her’ (Luke 10:38–42). This ceaseless over-activity explains why she is usually shown holding a cooking spoon. She is shown carrying St Martha’s traditional symbol of a wooden spoon. She has keys hanging from her girdle because she is the keeper of the home. In John’s Gospel, Martha and Mary appear in connection with two incidents: the raising from the dead of their brother Lazarus (John 11) and the anointing of Jesus in Bethany (John 12:3). In the account of the raising of Lazarus, Jesus meets with the sisters in turn, Martha followed by Mary. Martha goes immediately to meet Jesus as he arrives, while Mary waits until she is called. Martha appears again in John 12:1–8, where she serves at a meal held in Jesus’ honour at which her brother was also a guest. The window was installed in 1969. We know the figure is St Mark because the figure is accompanied by Mark’s usual symbol of a lion (bottom left). Tradition identifies St Mark the Evangelist with a companion of St Paul named John Mark mentioned in Acts (12:12, 25; 15:36–40). He is probably the same Mark mentioned by St John (13:5, 13) and St Peter (1 Peter 5:13). John Mark was cousin to St Barnabas (Colossians 4:10), which may explain why Mark was chosen for a window in this Church. Mark’s mother was a prominent member of the earliest group of Christians in Jerusalem. She must have been fairly wealthy, for her house was large enough for this ‘church’ to meet in it. It was to her house that St Peter turned on his release from prison (Acts 12:12–17). Perhaps this incident helps explain how Mark met Peter. He was certainly a disciple of Peter later in life. Mark accompanied his cousin Barnabas on St Paul’s first missionary journey (Colossians 4:10; 2 Timothy 4:11; Philemon 24; Acts 15:36–40). The context of Acts 13:5 suggests Mark helped in preaching the good news. He found the work hard: Acts 13:13 says that Mark had deserted Paul in an earlier missionary endeavour. Paul did not trust him again so, after a sharp dispute between Paul and Mark, Barnabas separated from Paul and took Mark with him to Cyprus (Acts 15:38). Mark probably witnessed the martyrdom of St Paul if he was in Rome at this time.